Mussolini's Italy is a compelling introduction to this infamous fascist dictator and his extraordinary rule. 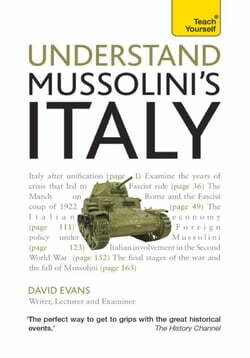 Though sometimes regarded as a farcical ruler, Mussolini's 'brutal friendship' with Hitler and his tyrannical killing of over a million people cannot be ignored as crucial aspects of modern... read more European history. David Evans' pacy and nuanced analysis of the rise and fall of this colourful yet dangerous dictator, will keep you gripped from beginning to end.